Emotional intelligence is having the ability to check in with yourself while understanding your emotional process. When kids are encouraged to explore their emotions, they have a better chance of growing into healthy, empathetic adults who are able to communicate their needs appropriately. The best way to teach kids about emotional intelligence is to model appropriate emotional behavior. In doing so, you can help them better understand themselves and communicate their needs in healthy, thoughtful ways. Regardless of age, it's always a good idea to encourage emotional expression. 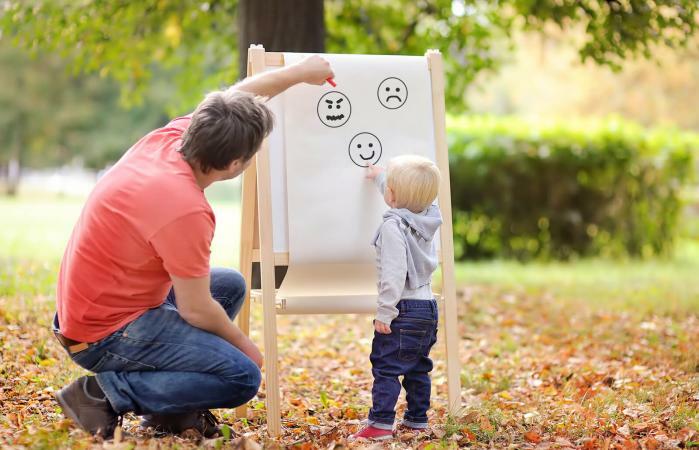 If your child expresses any emotions that feel triggering or uncomfortable to you, it's important to take a look at your own relationship with your emotional process so you don't unconsciously dampen your child's expression. Babies and toddlers are like little sponges. They are incredibly observant even if they aren't fully communicating what they're noticing. Help your little one learn about emotional intelligence. Use their favorite toys or objects and do some playtime with them. Note how each object or toy feels and begin to introduce simple emotion labelling. This includes feelings-words like happy, sad, angry, frustrated, and tired. Even for infants, hearing familiar words will make teaching them about emotional expression that much easier. Use a poster board and draw or print a simple smiley face, angry face, tired face, confused face, and frustrated face. If your little one is a toddler, you can have them show and tell you how they feel. If they are having a hard time, help them out by saying, "It looks like you feel (insert emotion) because you are (insert behavior)." For example, "It looks like you feel happy because you are smiling and laughing." For older toddlers, you can point out people and animals and ask them how you think they feel and why. After they name an emotion, you can ask what your child feels in their body when they experience the same emotion. For example, if your child says that an animal looks angry, you can say, "Where do you feel anger in your body?" Having these mini targeted conversations can help solidify their emotional understanding while providing a good base for empathetic development. As your child becomes a preteen, they will develop a greater capacity for empathy. Keep in mind that empathy is something that needs to be taught and nurtured so it can continue to develop as your child gets older. Help them understand their own feelings and other's different perspectives in a few ways. Watch your kid's favorite show or movie with them. During a dilemma that the characters face, ask your child what they think the character is thinking and feeling and why. At the end of the show or movie, you can ask them when is the last time they felt the same way as the characters. You can also ask them how they would have handled a similar dilemma. As they think about it, give them the space to formulate an answer themselves, even though it can be tempting to jump in. Healthy coping skills are a huge part of emotional intelligence development. Let your child pick out a creative outlet such as journaling, drawing, or playing music. Model this for them by picking your own outlet and letting them know that you're spending some time processing your day by (insert action) and encourage them to do the same. Give them positive feedback every time they spend some time processing how they feel. Ask them if they'd like to share their art work or writing with you afterwards. During the teen years, it can be difficult to connect with your child, let alone teach them about emotional intelligence. Be sure to model the behavior that you are encouraging in your teen. Ask them to volunteer and allow them to pick the non-profit so they feel like they have some control over the decision. Volunteering is a great way to give teens a good taste of what the world is like. Volunteering exposes them to other's experiences and encourages them to reflect on their own lives. In doing so, they develop insight and build skills to better connect with themselves. Engage your teen in a conversation about challenges that you faced when you were their age. Discuss your feelings, how you handled situations, and ways you coped. Ask them what they would have done in similar situations and how they would have felt. Try to come up with healthy coping skills together. An adolescent's brain is still developing, so it is critical to encourage them to slow down and be thoughtful. This usually does not come naturally for teens, so teach them how to take steps towards making a well thought out decision. If they are visual learners, help them examine a fairly easy decision using a chart. Be sure to include emotions, where they feel the emotions physically, the intensity of the emotions, pros and cons, how the decision will impact others, as well as possible outcomes. This can help them connect to themselves, develop emotional intelligence, and form a healthy decision-making process. It is never too late to begin teaching your child about emotional intelligence. Doing so can help them develop into thoughtful, empathetic, and insightful adults who are able to communicate effectively.